Y’all, I’ve gotta apologize. 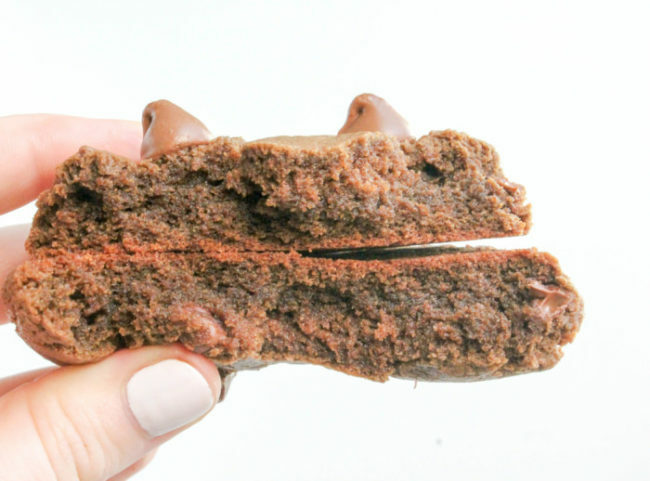 I posted these drool-worthy cookie photos to my Insta stories about a month ago saying they were “coming soon” and yet, here we are a month later finally getting around to writing the recipe so you too can recreate this magnificent chocolate cookie. But I promise, this recipe is worth the wait. Typically cookies with a chocolate base are not my thing. 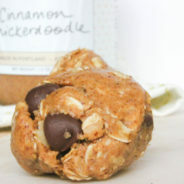 I’d rather have a regular chocolate chip cookie with as many chocolate chips as is physically possible jammed inside. 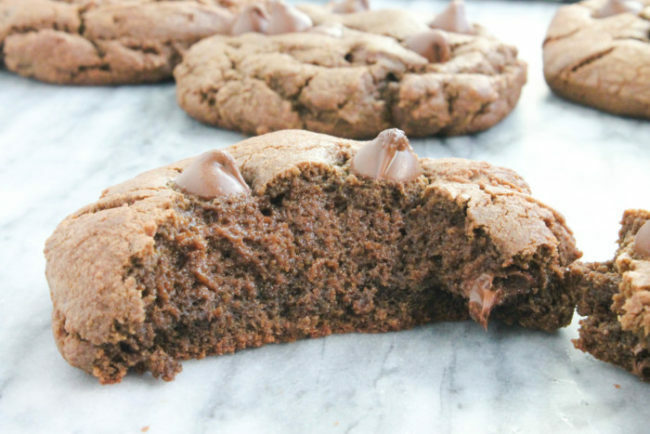 That is until I met this double chocolate chip cookie. 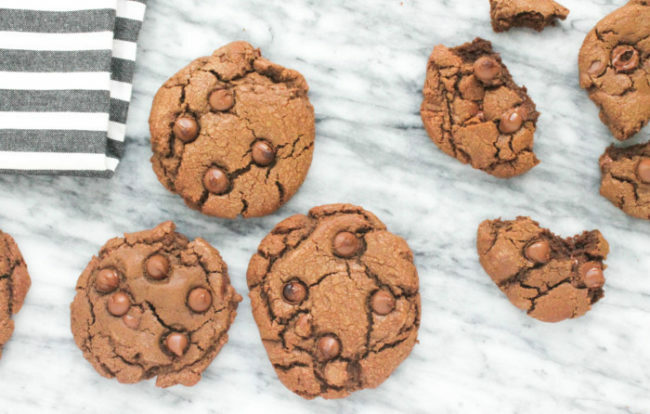 It actually kind of qualifies as a triple chocolate cookie since there is melted chocolate, chocolate chips AND cocoa powder. 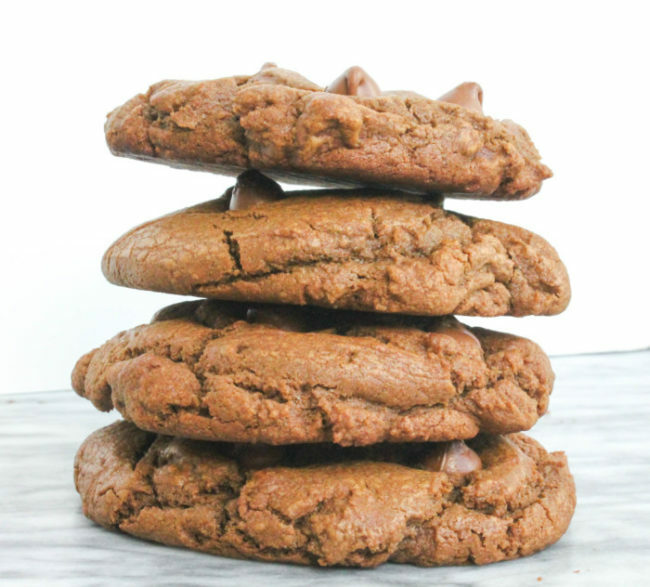 These cookies live up to their jumbo name, which just means there’s a lot of extra room to pack in all the chocolate. These cookies were the last thing I baked down in North Carolina before packing up my mixer and moving back north to the Caribbean climate of Boston. (But for real Mother Nature, where is spring?!) And well, moving is all-consuming. Especially when Mother Nature decides to throw four Nor’easters your way in three weeks right in the middle of flying back and forth for work and trying to coordinate a move and drive up the east coast. So yes, this recipe is long overdue, but better late than never right? Anyways, let’s talk about these cookies. One thing that I missed about living in a city is access to so many great bakeries. In Boston, Flour Bakery is hands down my all-time favorite spot, though there are a lot of new ones that have popped up since I moved away that are on my list to try. I’ve never actually been to Levain Bakery in New York, but I’ve drooled over their jumbo cookies on Instagram for a long time now. You know you’ve seen that classic Levain cookie shot, where the cookie is broken in half and the person can still barely fit it in their hand. Kind of like this (note: this cookie shot is not easy to capture one handed. 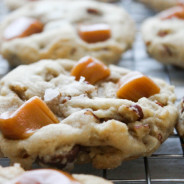 There were a few cookie casualties in the shooting of this recipe.) That actually sounds morbid. No cookies died – some just broke and I ate them because they were fresh to death. Literally. So I spent a long time researching what gives these cookies their fluffiness, and everything pointed to Cake Flour. 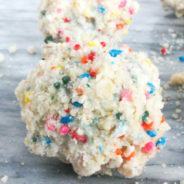 I’ve actually never baked with cake flour prior to this recipe. I don’t like baking cakes or cupcakes, and I don’t actually like eating cake (except Funfetti – the Pillsbury Dough Boy knows what’s up). But I’m always up for a new challenge, so I decided to experiment with cake flour for this recipe. And hot diggity damn. These cookies came out perfectly. I’m no Bill Nye, but based on my searches on the world wide web I learned that if you want to make really soft cake layers, reach for cake flour. Cake flour has 8-9% protein, making it the weakest flour on the shelf, and it bakes up into meltingly tender cake layers. Knowledge is power, y’all. I fit about four giant balls of cookie dough on each baking sheet, making sure there was plenty of room in between each to spread out. 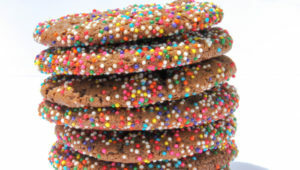 Turns out sky’s the limit with these bad boys, because they are not only wide cookies, but maintained their height as well – with a fluffy, chocolatey inside. 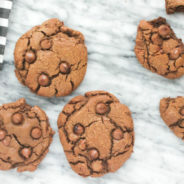 While I wasn’t much of a chocolate cookie lover originally, these double chocolate cookies have converted me. I love adding melted chocolate into any recipe that calls for cocoa powder because it really ups the ante on the chocolate taste, while keeping the flavor nice and mild. 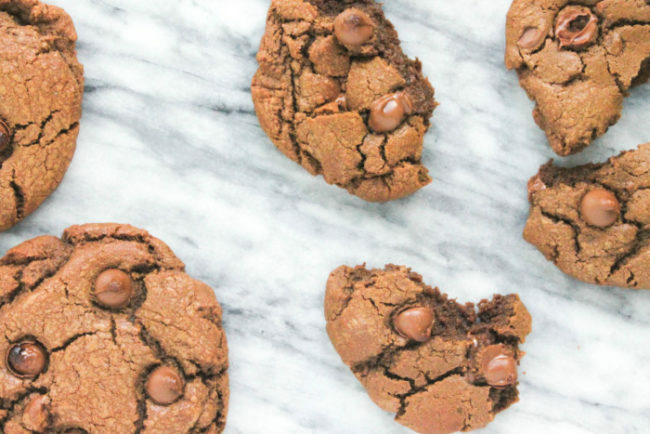 Sometimes too much cocoa powder can make the cookie crumbly and dry – so the combination of melted milk chocolate and sifted cocoa powder, plus tons of milk chocolate chips is money. If you are a dark chocolate lover, you could definitely modify this recipe with dark cocoa powder or melted dark chocolate. 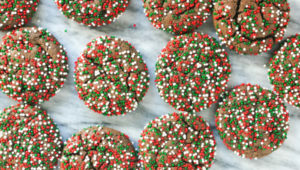 The hardest part of these cookies? Not eating the entire batch when they came out of the oven. As you can see in the photo above, I did some extra “quality assurance” testing before putting a bow on this recipe. Quality people, I’m focused on quality! And I love chocolate. 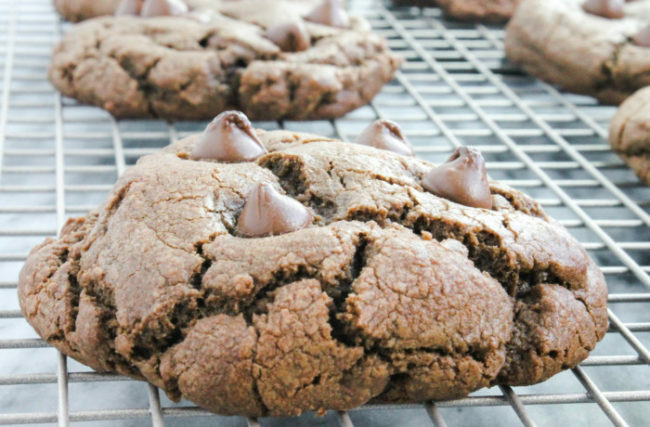 So if Mother Nature is going to continue to wreak havoc with winter weather, the one good thing is that summer bods are still months away – so don’t put away your comfy sweaters yet, and whip up a batch of these Jumbo Double Chocolate Chip Cookies today. Enjoy! 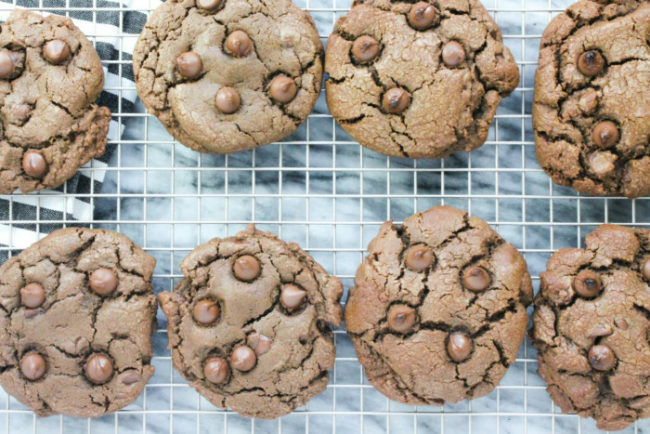 These jumbo double chocolate chip cookies are the perfect dessert for the chocolate lover, jam packed with cocoa powder, melted chocolate and lots of milk chocolate chips. Melt 1/3 cup of milk chocolate chips, stirring every 20 seconds until creamy, and set aside to cool. Combine the cold butter cubes, granulated sugar, and light brown sugar in a mixer and beat for two minutes on medium speed until incorporated. It's important for the butter to be cold, and cutting it into cubes helps it combine better than if you put a full cold stick in. 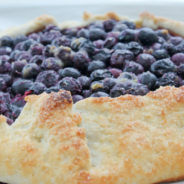 Scrape down the sides of the bowl before adding in the remaining ingredients. Beat in the eggs and vanilla extract on medium speed. Spoon in the melted milk chocolate and mix until incorporated. 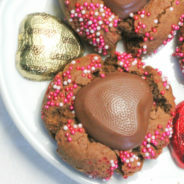 Sift together the cocoa powder, all-purpose flour, cake flour, corn starch and baking soda. Slowly add the dry ingredients to the batter on a low speed, mixing just until the dry ingredients are incorporated. Fold in the milk chocolate chips until evenly distributed. Chill the dough for 15 minutes. Preheat the oven to 400 degrees F. On a sil-pat or parchment-lined baking sheet use a large cookie scoop to place large balls of dough at least two inches apart. You should fit about 4 cookies per baking sheet. 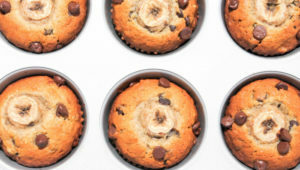 Press down lightly with your hands and top with a few remaining chocolate chips. Bake at 400 degrees F for about 10-11 minutes. Let the cookies sit on the cookie sheet for a few minutes before transferring to a wire rack to finish cooling. Enjoy!